This famous name is of early medieval English origin, and has been the subject of much dispute as to its meaning. The most reasonable and likely interpretation is the simplest, that the surname derives from a nickname for a spearman or a belligerent person. The derivation is from the Middle English "schak(k)en", to brandish, shake, with "speer", spear, a development of the Old English pre 7th Century "sc(e)acan" and "spere". A number of similarly formed surnames support the straightforward interpretation of the name: Shacklock or Shakelock, a lock-shaker, gaoler, Shakelance, a spearman, and Shakeshaft, also for a spearman. 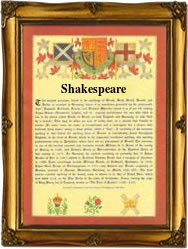 The development of the name includes Simon Shakespere (1324, Staffordshire), and Robert Schaksper, (1379, Yorkshire), while the modern surname can be found as Shakespeare, Shakespear and Shakspeare. The most famous of all English dramatists, William Shakespeare (1564 - 1616), was born in Stratford-on-Avon in Warwickshire, where the name is still frequently found. Among the recordings of the name in London is that of the marriage of John Shakespeare and Sara Chattel at St. Mary Mounthaw, on October 9th 1608. The first recorded spelling of the family name is shown to be that of William Sakespere, which was dated 1248, in the Old Charters of Gloucestershire, during the reign of King Henry 111, known as "The Frenchman", 1216 - 1272. Surnames became necessary when governments introduced personal taxation. In England this was known as Poll Tax. Throughout the centuries, surnames in every country have continued to "develop" often leading to astonishing variants of the original spelling.